The Mahomet resident grew up in Texas. He's worked on grazing and forage management for the past 35 years. Richard G. Hungerford, Jr. of Mahomet was recently awarded the 2011 American Forage and Grasslands Council's Distinguished Grasslander Award this summer at AFGC's annual conference held in French Lick, Ind. Hungerford is known locally and across the state for his knowledge, experience, and passion for grasslands, pastures, and livestock management issues of all kinds. His commitment to the science and art of good grazing earned him the status of AFGC's Distinguished Grasslander because Richard has worked so long with grazing issues and successful natural resource management in both his professional and private life. 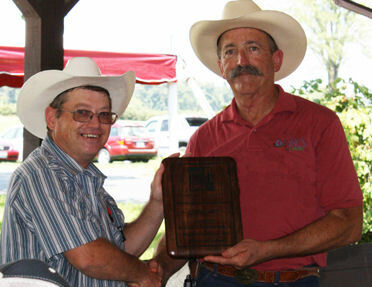 Richard G. Hungerford, Jr. of Mahomet is awarded the 2011 American Forage and Grasslands Council's Distinguished Grasslander Award. Richard grew up in Odessa, Texas. He attended college and earned a Bachelor of Science degree in Forestry from Stephen F. Austin University and Range Management from Sul-Russ State University. Richard began his career with USDA's Natural Resources Conservation Service (NRCS) in Texas as a range conservationist in Archer City, followed by positions in Del Rio. He served as District Conservationist in Nacogdoches, Texas and Area Range Conservationist in Pecos, Texas where he assisted ranchers to develop grazing plans and successfully apply grazing management practices. Later he was promoted to NRCS' Resource Conservationist position in North Dakota where he worked for 6.5 years and trained both agency employees and ranching clients in planning and applying grazing management systems. Richard then became a Rangeland Management Specialist at the USDA-NRCS National Technical Center in Lincoln, Neb. From Lincoln he brought his talents here to Illinois where he has worked diligently to promote forage management and grazing practices across the state. He currently serves as State Resource Conservationist for USDA-NRCS in Champaign. He is a member of the American Forage and Grassland Council and the IL Forage and Grassland Council. As a Society for Range Management member, Richard is a Certified Professional in Range Management. According to friends, colleagues, and clients, Richard has a natural gift for training and teaching others in both technical and practical terms; he can make any training material easier to understand and has a willingness to partner up with others to find solutions that work.